The funny thing is that I’m subscribed to the Foundry newsletter twice with two different e-mail addresses. And it turns out that I’m one of the “restricted number of valued customers” twice over. Hmmm. Now either I’m genuinely lucky or there’s a surprisingly large number of other lucky people out there. I wonder just how lucky I am and how restricted the number is. I’d be curious to know if you’ve received something similar. UPDATE 2/4/2010: Strangely, in the less-than-24 hours since I published this post, I’ve only heard from people who have been as “valued” as me. I’d really like to know if there are any subscribers to the Foundry newsletter who have not received this offer. This weekend sees another key date in the annual wargaming calendar – Colours at Newbury Racecourse. This is a regular in my diary and I’ve enjoyed it all the more since it moved away from the cramped and difficult-to-park-at Hexagon in Reading. For me, getting there on Sunday (I don’t go to the Saturday of this two-dayer) is a simple drive East along the A4 and the parking at the Racecourse is free. So I’ll be sitting down to compile my shopping / to-do list tonight though it will be hampered by the fact that the Colours website yet again doesn’t (at the time of writing) have an up-to-date list of traders or demo games. It’s only two days to the show, guys, surely you could manage to make this information available by now? Still, that’s a minor gripe and, more importantly, I’ll be meeting up as usual with Peter F. So that gives us an opportunity to pick up the Calpe threads after our Summer breaks. We’ve got several things on the agenda: completion of the PayPal functionality for the website, progress on the next Saxon releases and a weekend of sculpting tutorials and mould-making later in the Autumn. If any of you are attending Colours and want to see what a painted Calpe Saxon musketeer battalion looks like, I suggest you check out the painting competition because Peter F. is almost certain to enter a little something. The other imminent event that’s caught my attention is the latest Foundry open day on 25th September. Plenty of juiciness to this with the presence of Kevin Dallimore (lovely chap) doing a painting clinic and a couple of big Napoleonic participation games. The trouble is there’s a snowball in hell’s chance of me (and I suspect many others) going. Why? Well, apart from a long journey to Nottingham (which Foundry can’t help) they’ve persisted with the lunacy of holding the open day on a Friday. Are they quite mad? Why can’t they schedule it for a weekend? Lastly, on a personal note, another event I’d like to mention is that tomorrow von Peter and his family end their eight month sojourn in the UK and begin a stately passage back to their home in New Zealand. It’ll take them quite a while to get there because they’re taking in a grand tour of mainland Europe on the way. So I’d just like to take a moment to wish them bon voyage and thank them for their good company and coffee-buying heroics while they’ve been here. UPDATE 12/9/09: there is now a list of traders on the Colours website but it’s not linked to from the home page (or rather the link there doesn’t work). After weeks of none too subtle plugging, the new Foundry Napoleonic wargames rules, Napoleon, have been published. And, as I write this, I daresay a group of gamers are feverishly trying them out at today’s Foundry open day (no, I don’t understand why it’s on a Friday either). Among the heaving throng will be von Peter and I fully expect him to report back imminently. The other thing that has happened is that Foundry have done what they should have done in the first place: they’ve actually put some legible images of sample pages on their website. Letting us see the goods is usually a much more successful marketing technique than teasing people for weeks on end until they get fed up. These sample pages give me a much clearer idea of what the whole thing is about – especially the design style and production values. I think that’s essential for something that has a 25 quid price tag. What it doesn’t enable me to do, of course, is offer you an erudite review. That’ll have to wait until (or if) I acquire a copy. If I were being cheeky, this is the point at which I’d suggest it wouldn’t do Foundry any harm to send me a review copy of the book. In fact, they might want to take that suggestion seriously as a way to counter-balance what I’m about to say about one sample page (pictured here) from the book. This particular page bears the title “War of Liberation (1813-14) Prussian Army” and discusses its organization. So you can understand how I was drawn to it like a moth to a flame. The first warning sign is that there’s a sub-heading “Divisions, Brigades & Batteries” – there was no such thing as a division in the organizatonal structure of the Prussian army at this time. What a dog’s dinner! 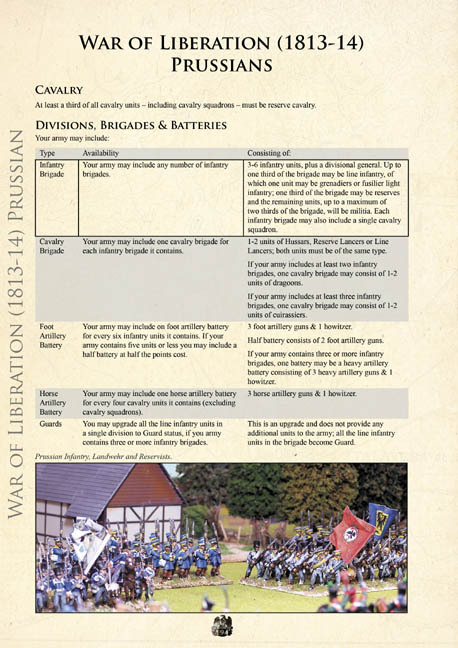 While not always composed identically, a generic Prussian brigade typically contained at least ten battalions (three line, three reserve, three landwehr and one grenadier). So where does the idea of three to six units come from? And what’s this business of a divisional general? There was no such thing in the Prussian army at this time. And then we come on to this weird restriction of only one grenadier or fusilier battalion in a brigade? Oh, and I thought the authors had defined this as an “infantry brigade”, so what’s with the cavalry? Lastly, historical Prussian brigades of the period also contained a foot artillery battery – but no mention of that here. I can see what’s happened – the authors have tried to shoehorn the unique structure of Prussian brigades into the divisional structure of other armies (like the British and French) with their sub-sets also called brigades. The trouble is, a Prussian brigade was a completely different beast to a brigade in other armies. In fact, it was even completely different to a division in other armies too. The result of this is that the authors have tied themselves in knots but, more worryingly, lots of people are going to get a completely false understanding of how the Prussian army was organized and the special distinctiveness of that will be lost on the wargames table. Sadly, anybody commanding or opposing a Prussian wargames army will be the poorer for it. Ignoring that “infantry brigade” clanger, this more or less works for reserve cavalry formations attached to Corps. Each historical Prussian Corps normally comprised four brigades plus reserve cavalry that typically included three cavalry brigades. The problem is that the allowance for cavalry in “infantry brigades” is probably too small. To go with this there are some rules about the make up of cavalry brigades which are acceptable though I really wish they wouldn’t use the term “reserve lancers”. There was no such thing in the Prussian army of this period and I’m certain they meant landwehr cavalry. Two problems here. A ratio of one battery to every six battalions would give almost twice the artillery firepower than was historically the case in Prussian brigades. Secondly, a Prussian brigade would always have had a whole battery at its disposal though it is true that brigade commanders were certainly flexible enough to deploy it as two half batteries in the field. What I object to is having an orphan half battery without the other half available too. Well, that’s confusing – what is meant by a “cavalry unit”? Judging by what’s in brackets, it’s not a squadron, so my guess is that it must mean one of the aforementioned cavalry brigades. If so, that’s closer to reality than the foot artillery allowance but, looking at OOBs, I’d have set this at one horse artillery battery to every three cavalry brigades and I’d have insisted that horse artillery could only be deployed with reserve cavalry. Oh dear! The curse of the brigade/division confusion strikes again but there’s more. The Prussian Royal Guard was pretty small and comprised specific units, so you can’t just go around upgrading any “division” (yuk!) you like to Guard status. And even if you could, why just line infantry units? There were cavalry, artillery and various forms of light infantry in the Royal Guard too. There’s no mention of specialist light infantry units like the Silesian Schützen, the East Prussian Jägers and the many volunteer Jäger detachments – but perhaps that’s on another page of the book. Looking back over what I’ve just written, I realise I’ve been rather pedantic. But I’ve only done so because I care about accuracy and I’m certainly not trying to have a pop at the authors. I know how much hard work and effort goes into this sort of thing given that I’m currently wrestling with my article for Wargames Illustrated on this very topic. But the point is that Foundry want people to pay 25 quid for this book and that’s no small outlay. So I reckon the least we deserve is accuracy. Lastly, I need to acknowledge that I’ve only examined this one page of the book in detail and it isn’t fair to judge the entire book on such a small sample. So don’t. Because I won’t. Ideally, I’d like to see the whole thing and review it properly on BfK – which enables me to sign off neatly by returning to that cheeky request for a review copy! I expect quite a few other people are subscribers to the Wargames Foundry e-mail newsletter like me. The latest one hit my in-box today and it had me bemused. They’ve just announced the latest extensions to their range of Napoleonics sculpted by Mike (no, definitely not Perry) Percy – more early Prussians. Plus yet another rather unsubtle teaser for their forthcoming and er… imaginatively titled “Napoleon” Napoleonic ruleset. The next two releases are alleged to be 1809 Saxons and 1805 Russians. This seems an odd combination to me. I guess 1805 Russians could still be used for 1807 but how much of the remnants of the Prussian army fought in that campaign? So those two ranges don’t really complement each other. Also, the Russians were no-shows for 1809, weren’t they? So how does doing 1809 Saxons fit with that? Or is this classic Foundry spoiling tactics to steal a march on the Assault Group ranges of 1809 Saxons and Austrians? Oh, as an aside, check out the latest sculpts of Austro-Hungarian hussars for that range (you may need to register with the TAG forum first). Perhaps Foundry are just aiming to provide a variety of French opponents but it seems more like a WTF range than a WF one.